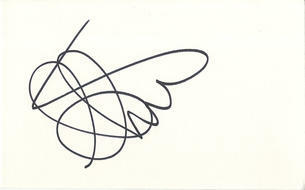 This is an In Person Signed White Card 5.5" x 3.5" by the former Tottenham and England Footballer. He began his career at hometown club Leeds United making his debut in 2003 as the youngest player in the Premier League. In 2005, he moved to Tottenham Hotspur for £1 million, where he made over 350 appearances across all competitions, winning the 2008 Football League Cup Final. On 1st September 2015 Lennon joined Everton on a permanent 3-year deal after his successful spell with the club on loan.